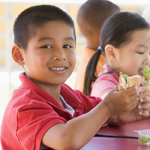 Our biggest successes have come from implementing celebration days or weeks around established events such as National School Lunch and Breakfast Weeks, National Nutrition Month, Read across America Day and Earth Day. We found it helpful to use resources available to minimize the amount of materials we needed to create. From our experience, poster or art contests elicited a good response and "Lucky Sticker Days" got students excited and increased participation. We keep it fun and exciting through the use of bright colors, fun themes, appealing items for giveaways, and involve other school members. If you choose to market via a Web site, keep it current. Whether you post menus only or use it as an avenue to communicate with parents, it is important to keep it current. Your Web site is a reflection of how your department operates. We want to encourage others that marketing can be successful even if you have no prior experience. What helped us the most was sharing our ideas with students, kitchen managers, teachers, parents, or administrators and utilizing their feedback on any improvements to the idea or materials. Be prepared with some specific questions on what feedback you want as this will avoid our favorite response "looks good to me."